The VeloNews Plan is the best, most comprehensive training guide we’ve ever published. This is part 2 of the series. 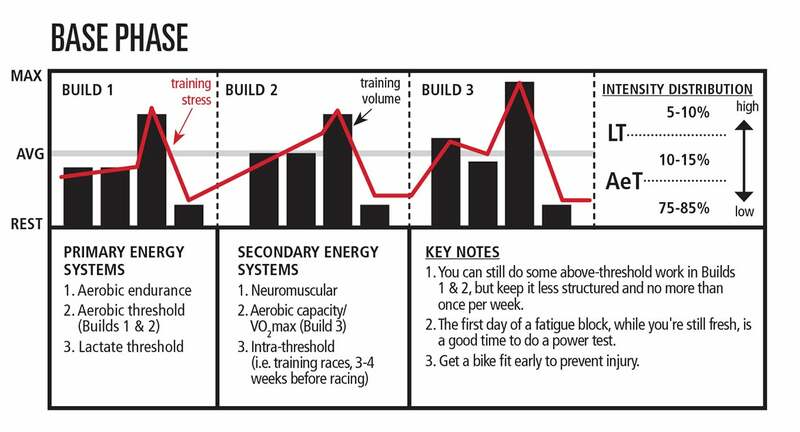 In Part 1 of the VeloNews Training Plan, you learned the fundamental principles of training. This second component will help you build a training plan that will take you to the next level of race performance and fitness. The following four charts illustrate how to map out each mesocycle (or phase). Use them as guidelines to create phases specific to you. Just employ the following principles. Overload: Seek to build an overload over two to four weeks, and then rest. Use the TSS patterns to help guide you. Target the right energy systems: Each phase targets only a few systems. Make sure the training stress you accumulate targets the right systems. Consistent work: In 2016, Dr. Seiler conducted a study that compared periodization methods. They all worked about equally as well. But riders who varied their interval work every week saw the least gains. Whatever workouts you pick, stick with them for at least four to six weeks. Vary your weeks: Figuring out the “perfect week” and then doing it every week is a good way to plateau. It neither overloads your systems nor allows recovery. Tip 6: Notice that 70-85 percent of training is below the aerobic threshold in all mesocycles. As much as we’d like to compensate with intensity, the science shows that the best endurance athletes do the bulk of their training below the aerobic threshold with selective intensity. Make sure you watch your distribution and train with the right mix. Factor in life: While it doesn’t produce adaptations, life adds stress. A regular training week on a high life-stress week can overload you. Keep it in balance. Every week, pick “must-do” workouts and “if-I-can” workouts to allow flexibility in overall life/training stress. Overload with two- to four-day blocks: It’s concerning when a rider trains an hour and a half for six days in a row. It’s this “in-between” training that flattens a rider. Don’t do the same thing every day. Train in two- to four-day blocks that build an above-average training stress and then recover for a day or two. High-intensity intervals and races during the season can generate enough stress to warrant a 1:1 ratio of training to recovery days. Quality before quantity: Effective interval and high-intensity work requires fresh legs. Long, slow, aerobic-endurance rides don’t. In fact, the endurance gains can sometimes be enhanced by doing long rides on somewhat tired legs. When building a two- to three-day block, do your high-intensity work first. At least one recovery day: Get at least one day of full recovery each week. Mondays are great for this since you’ll often need the post-race rest during the season. Do not lift weights, run, ski, or do any other work. Use the time to nap or stretch. Listen to your body and be flexible: You don’t know how your body will respond or what’s going to happen with your life when you map out your week. Sticking religiously to a plan and finishing a week fatigued when you should be rested shows great commitment and poor judgment. Your body decides when it’s recovered: There’s no rule for how long it takes to recover after an overload. It could take two days or more than a week. On recovery weeks, it’s essential to listen to your body and let it decide when it’s ready. Limit high-intensity work: Above-threshold work is very damaging. The science is very consistent on this — one to two sessions per week is ideal, even for pros. Three is manageable but not any better. More than three is a recipe for burnout. Schedule off-the-bike work: Weight training, stability and core work, stretching, and yoga all help your training, health, and longevity. Unless you only have five hours to train per week, it is better to skip an hour or two of ride time than to skip off-the-bike work. Weights are more damaging than riding: Lifting weights can damage your muscles more than any ride. Don’t do them on a recovery day and avoid them less than 24 hours before an interval session or race. There’s nothing magical about certain workouts. As long as they target the right system, they will work. Here are a few workouts that have consistently demonstrated positive results. • Focus on high cadence, 95-100rpm. • Avoid hard efforts; don’t hit that five-minute climb at 350 watts. • Spend the bulk of your time in zone 2 rather than trying to average a zone 2 heart rate or wattage. • Wait until at least the Build 2 phase to attempt this type of ride. • This is any ride that isn’t interval work or a long endurance ride. • It should feel very easy. • Great opportunity to do neuromuscular work. • Do this workout on a trainer before your regular ride or as a warm-up. • Vary the cadence range depending on your ability (i.e. 90-120 if new, 110-160 if you are a skilled track rider). • Try to stay under 120 watts. • Try to spin up to 90-100rpm with 2 min. rest between efforts. • Do these sprints seated. • Focus on form; do not rock on the bike. • Finish with a 30-sec. low wattage spin-up to as high a cadence as you can do while maintaining good form (don’t bounce). • Show up to ride hard and be part of the group—but know your limit. If you’re still in the middle of your base, one hour with the group may be sufficient. • Find a 10-30-minute climb and do repeats in zone 3, for a total of 40-60 minute. Do the rest of the ride in zone 1. • If climbs aren’t available, simulate on a trainer or a route with little traffic. • This is a great way to get your legs ready for your first race of the season. • This is great on a trainer for consistency. • Focus on steady, consistent wattage. • Your power will be lower than in T1 or T2 workouts but you should still focus on consistency. While certain intervals target high-end energy systems better, there is a great deal of overlap between above-threshold intervals. All of these workouts are too short for effective heart rate response. Go by power or feel. And remember, don’t do them more than two times per week. Intensity: Do this work at a wattage similar to your 5-minute power/VO2max test wattage. • Focus on steady wattage; don’t start at 400 watts and finish at 200 watts. • Try these on a climb by starting at the same place and attempting to finish at the same place each time. • Use a road with minimal turns or traffic. • Target 130-150 percent of FTP wattage. Tabata intervals (short efforts with shorter recoveries) are becoming popular for targeting both anaerobic capacity and VO2max. • Try to stay mostly seated. • Stand for the first few pedal strokes then finish seated. Unlike the other above-threshold workouts, sprint work allows for much longer recovery times. Adaptations only take a few weeks. • Use a slight uphill grade. • Pedal minimally between sprints. • Do sprints both seated and standing. The ways in which good training intentions can backfire are quite predictable, according to Houshang Amiri, head coach of the Pacific Cycling Centre, and Grant Holicky, a head coach at Apex Coaching. We asked them what training mistakes they see most often. Here are their answers. Riding at the wrong intensity: “Training is about working the edges of the system,” Holicky says. Athletes often make the easy days too hard, which causes extra fatigue and forces the hard days to be too easy. The solution is simple: make your easy days truly easy so your hard days can be as hard as they’re supposed to be. Adopting a negative mindset: Not every workout or race will be perfect. Having a negative mindset causes athletes to, “forget about their hydration, their nutrition, their race strategy, or training strategy. Everything goes out the window,” Amiri says. Negativity makes you reactive, instead of active. The solution: focus on how to make the most of each workout and race. Focusing on details over trends: Less experienced athletes often fail to understand the dangers of interpreting anything based on one ride. Focus on explanations, not excuses, as a way to spot trends. Trends are a line pointing in a direction. Explanations and excuses don’t change where it points. You’ll get further focusing your energy on figuring out how to shift the line. Focusing on outcome instead of process: Focusing on outcomes can feel daunting and unachievable. More importantly, it can take your focus away from making the most out of each day’s training. Amiri feels that if you focus on the training process, the outcome is going to happen by itself. Failing to balance training with recovery: Most cyclists are great at tearing themselves apart, but not at putting themselves back together. Our bodies adapt during recovery, making it essential to the training process. If normally you are mentally invested in your workouts but suddenly find yourself miserable and dreading them, it’s better to walk away. “The workout is probably not going to create a positive return down the road,” Holicky says. Focusing only on strengths: Even if you’re a great climber, at some point you’re going to have to sprint against the riders who can climb with you. Amiri recommends regular benchmarking to identify your weaknesses. This can include power tests, physiological testing, and/or doing a local crit, descent, or time trial. A good coach will help you identify your weaknesses and make a plan to solve them.